Poster/chart printed on thick paper, approximately 60 x 46cm. March 1945. Illustrates the visual bombing raids undertaken by the 8th AAF's 91st Bombardment Group (Heavy Bombers) during March 1945. 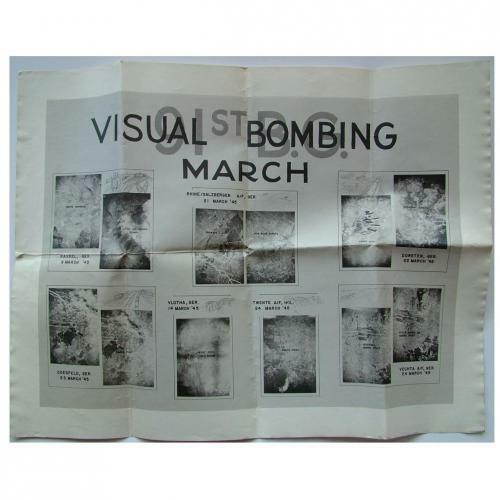 Shows 7 raids with the target name, a pencil drawing of the target, aerial photograph/s and raid date. Includes Kassel, Coesfield, Vlotha, Dorsten, Twente, Vechta & Rhine/Saltzbergen. Folded and with light soiling and a couple of small edge tears. The 91st operated from AF Station 121, RAF Bassingbourne and consisted of the 322nd, 323rd, 324th, and 401st Bomb Squadrons. It operated B-17 Flying Fortress bombers, the most noted aircraft of which was the legendary Memphis Belle. ,Stock code P20418.